During the three-month period in residence at the guest studios I will be working on a film, the third part of a trilogy investigating relations between visual representation and economic processes. In this film I am looking at the emergence of the field of financial journalism in the 1840s in relation to the first appearances of photographs in newspapers in the 1880s. I have been conducting research at the International Institute of Social History in Amsterdam regarding this period in relation to a notebook of Karl Marx’s from 1868 dedicated to The Economist and Money Market Review. 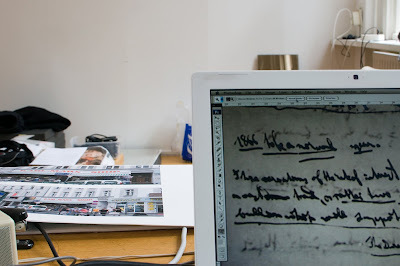 During my time in residence at the guest studios I will be both carrying out research at the Koninklijke Bibliotheek, specifically in their vast newspaper archive, and synthesizing this material with that of the Marx notebook. This synthesis will be carried out in the medium of film and video.